Placing a locate requests is a crucial step in your excavation work. Calling us, as a preventive measure, will keep you informed of what lays below in order to excavate safely. *Important: When creating your request, make sure to clearly identify your work site on the map, because your Google sketch will determine the members that will be notified of your work. The Municipality, Civic address, Street and Intersections fields are only used to open the Google map. Our free and speedy service will guarantee your safety and that of your neighbors as well as protecting the environment and ensuring the continuity of services. 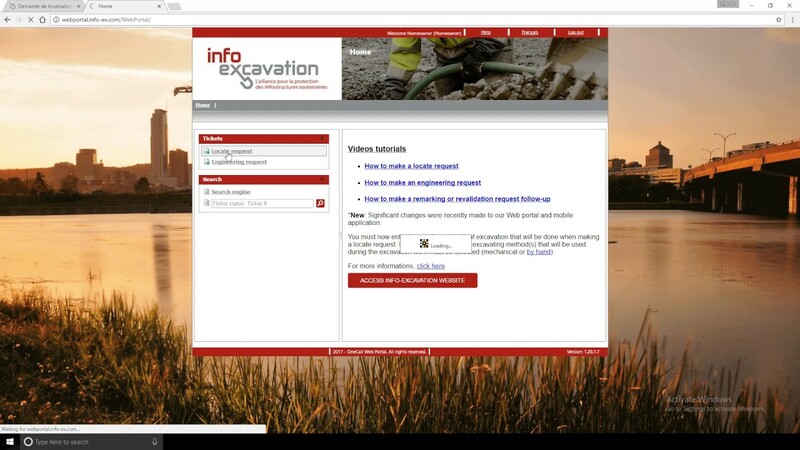 A locate request helps you know where underground networks owned by Info-Excavation’s member companies are located near your excavation area. It will help prevent accident related damages that could be potentially costly and dangerous. Doing safe excavation work is all to your companies’ advantage. Excavate while ensuring the safety of citizens! By focusing on the integrity of public services and ensuring the safety of its citizens, municipalities must, at all times, place a locate request before starting any excavation work. A locate request helps determine the location of underground networks of Info-Excavation’s member companies and prevent costly and potentially dangerous damages. Our tutorial videos are made to help you with your locate requests, corrections, and updates as well as revalidation and remarking requests. You can consult them by clicking here. If you are not digging but wish to know the location of underground infrastructures, then you must complete an engineering request.